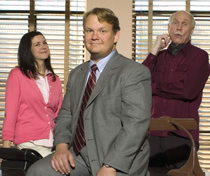 In this sitcom, Andy Barker (Andy Richtor) is an earnest CPA who starts his own accounting company. Business prospects look grim until he’s mistaken for Lew Staziak (Harve Presnell), a detective that formerly occupied his new office. Andy somewhat reluctantly takes the case much to the dismay of his perky and loving wife Jen (Clea Lewis). Andy’s fellow bored stripmall merchants — Simon (Tony Hale), Wally (Marshall Manesh) and Jessica (Ion Overman) — join him in his dicey investigations and Andy proves he’s a consummate problem-solver. Andy investigates a 40-year-old case in which an old flame of Lew’s went to jail claiming that she was innocent. You can read the details here. First aired: April 14, 2007. More about: Andy Barker P.I. Andy Barker, P.I. : Is the NBC Sitcom Pulled Already? i loved this show. can’t wait for conan to take over tonight show.